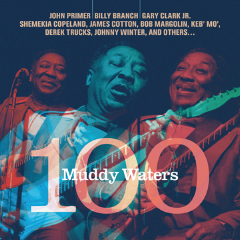 A 100th birthday tribute album to Muddy Waters that features former Waters band members and collaborators John Primer, Bob Margolin, James Cotton, and Johnny Winter as well as such other guests as Shemekia Copeland, Billy Branch, Keb’ Mo’, Gary Clark Jr., and Derek Trucks sounds like a perfect idea. And, for the most part, it is, on Raisin’ Music’s Muddy Waters 100, with Primer taking the lead on vocals and guitar for an array of songs spanning Waters’ career, from his early 1940s Library of Congress field recordings by Alan Lomax to the title track off Muddy’s 1978 Grammy Award-winning I’m Ready. As a featured vocalist and guitarist with Waters’ band for the last three years of the blues legend’s life, there are few living blues performers today more qualified to lead this project than Primer, save perhaps for one of Muddy’s own flesh and blood in Larry “Mud” Morganfield or Big Bill Morganfield, neither of whom are included here in any way, somewhat surprisingly – especially considering the uncanny resemblance of Mud’s vocals to his father’s. That said, Primer himself sounds pretty darn close to Muddy on a few songs, such as, for example, a “Forty Days and Forty Nights” that features hot-shot guitarist Gary Clark Jr. as well as Vincent Bucher on both harmonica and guitar, and a patient, scaled-back “She Moves Me” that includes Matthew Skoller on harmonica, Billy Flynn on guitar, and Kenny “Beedy Eyes” Smith (son of Waters band drummer Willie “Big Eyes” Smith) on drums – the latter two of whom make up half of the session’s backing band (The Living History Band), along with Johnny Iguana on keyboards and Felton Crews on bass – in addition to Primer’s superb vocals and guitar. 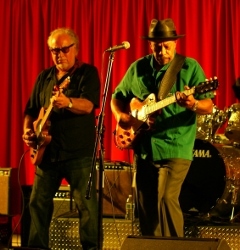 Fellow Waters band alumni Bob Margolin (who played guitar with Muddy for seven years prior to Primer) and harmonica ace James Cotton add further authenticity to the project, with Margolin featured on a dozen of the 15 newly recorded tracks and Cotton on a pair: “Good News” and “I Feel So Good”, both songs on which Cotton played on the original Waters versions. Though never part of Muddy’s band, the late guitarist Johnny Winter was a frequent collaborator, having produced and played on four albums (including three Grammy Award winners) for Waters during the late-1970s and into the early 1980s. One of those was of course the Grammy Award-winning I’m Ready, the title track of which Winter helped re-create for this project just weeks before his death last summer, offering one of the very last glimpses of Winter’s masterful work on slide guitar. Many of the songs here are presented in close to their traditional forms, though often incorporating subtle modern effects such as electronic drums and drum loop programming. On a couple of tracks, these additions tend to be a good deal more prominent, and may strike some as a bit over-the-top, including, for example, with the drum looping that helps to drive both a funky, rapping “Mannish Boy” that’s further accented by handclapping and Skoller’s harmonica and the dance electronica of “Trouble No More”, one of several tracks featuring Chicago harmonica player Billy Branch, with Tim Gant (clavichord) and Blaise Barton (synth bass, Farfisa, tambourine) providing additional textures. While these updated takes on Muddy’s classics may not appeal to everyone, they do help to demonstrate two-time Grammy-nominated producer Larry Skoller‘s (Heritage Blues Orchestra, Chicago Blues: A Living History) belief that “in one way or another, these sounds all lead back to Muddy Waters”. What likely will appeal to everyone, though, is just about every other song on here, from the powerful opening “Got My Mojo Working” featuring Shemekia Copeland on vocals with Primer, to the fiddle- and mandolin-laced “Rosalie” with Margolin on acoustic guitar (originally recorded by Alan Lomax and John Work III on the Stovall plantation 73 years to the day of this album’s July 24 release, where Muddy joined Son Sims on fiddle, Louis Ford on mandolin, and Percy Thomas on guitar to make up the Son Sims Four), to the creeping, closing “Feel Like Going Home” made up of just Primer on vocals and guitar, Crews on bass, and Smith on bass drum. Primer is joined by a rotating cadre of talented guests on slide guitar throughout the album, including Derek Trucks on “Still a Fool” and Keb’ Mo’ on “Last Time I Fool Around with You” – which also includes some terrific tickling of the ivories from Iguana and interesting percussion from Barton – in addition to Winter on “I’m Ready” and Margolin on “I Be’s Troubled”, while Leanne Faine adds some Mavis Staples-like vocals on “Why Don’t You Live So God Can Use You”. The officially authorized album is packaged as part of a 48-page, CD-sized hardcover book that also includes an original essay by Waters biographer Robert Gordon and a nice collection of photos of Waters both on his own and with friends and family including James Cotton, Eric Clapton, John Primer, Johnny Winter, Son Sims, the Rolling Stones, Louisiana Red, and Waters’ wife Geneva, among others. In addition to having helped Primer fulfill his dream of one day recording a tribute to Muddy Waters, there’s a good chance Skoller – who also produced the Chicago Blues: A Living History project of which Primer, Branch, and the backing band here were all also a part – may have helped the blues guitarist to earn his next Grammy Award nomination as well. This entry was posted in Albums and tagged Billy Branch, Billy Flynn, Bob Margolin, Derek Trucks, Felton Crews, Gary Clark Jr., James Cotton, John Primer, Johnny Iguana, Johnny Winter, Keb Mo, Kenny Beedy Eyes Smith, Larry Skoller, Leanne Faine, Matthew Skoller, Muddy Waters, Shemekia Copeland, Vincent Bucher. Bookmark the permalink.